The upcoming 2019 Porsche 911 992 generation won’t look vastly different from the outgoing 991.2. I know this because I’ve seen the mules already. So have you. They’ve been running around Ann Arbor, Michigan, the Nürburgring and now, apparently, Salt Lake City, Utah. What’s weird is that Porsche is still taping them up in the back. 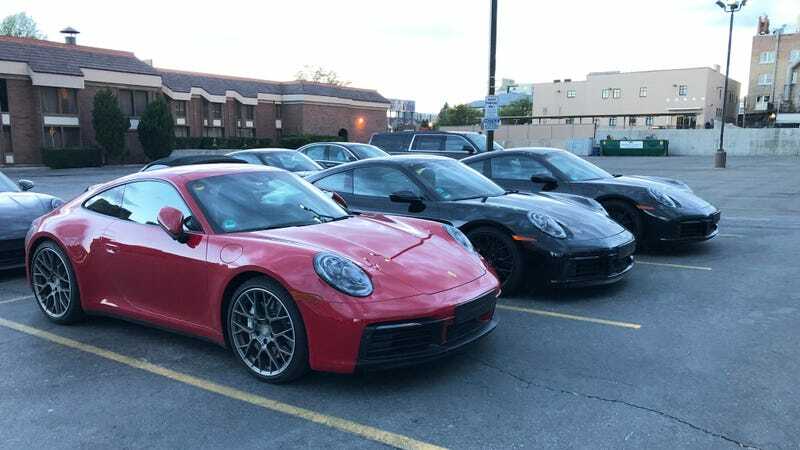 Eagle-eyed reader Christopher Calder spotted these 911 mules parked at the Sheraton in Salt Lake City early yesterday morning. There are a number of race tracks in the area and it’s also not terribly far from the Bonneville Salt Flats. There’d be a good reason for the cars to be in Utah. What could this car be????? What’s weird is that, even though we seen the new 911 on multiple instances, Porsche still insists on taping up the rear badge and side-marker lamp. Usually, that’s the spot where Porsche would write its own name, decreeing to the world that the sports car you’re following is indeed a Porsche, and maybe the model name. Why the tape? What the hell else would this car be! They’ve looked the same for over 50 years! Anyway, the new 911 will probably be lighter, more efficient, perform better and also maybe be electrified in some form or another. Visually, the front of the new car still sports the iconic 911 round headlights, but the rear has been updated lightly with a horizontal light bar, which I am very much a fan of. Also parked in the crowd is what appears to be the 718 Boxster. The new 718 Boxster Spyder, perhaps?